My husband LOVES pecan pie and every time we visit his mom she has a pecan pie waiting! This is generally dessert that night AND his breakfast the next morning! Since he loves this pie so much I asked my mother-in-law, Carolynn for her recipe and come to find out her mother-in-law had passed it on to her! 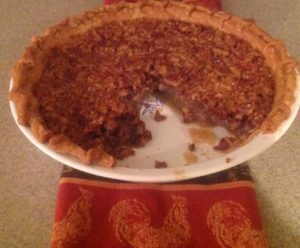 This is a super easy pie to make with a couple of tricks she told me – first off the goo to pecan ratio is key, don’t over cook or you won’t have nice gooey pie and use foil or a pie crust cover so the crimped part of the crust doesn’t get overcooked. As you can see he had to dive in before I could get a picture! Enjoy! If making pie crust follow the direction for Maggie’s Pie Crust Recipe or place purchased pie crust in a pie pan and crimp edges. In a mixer cream the eggs and sugar, add the remaining ingredients except for pecans and mix well. Pour mixture into the pie pan with crust, evenly add pecans to the top, use foil or a pie crust cover to cover the crimped edges of the pie and place in a preheated oven of 325 degrees for 55 minutes. Let cool and serve!